Temperatures have been climbing in Sonoma County lately, so this is a bento made from leftovers from last night's cold foods dinner: pasta salad and watermelon! I added sliced olives, fresh mozzarella, tomatoes, onions, and sliced pepperoncini peppers to bow-tie pasta and dressed it with greek salad dressing and a bit of pepper. In the other container are chunks of watermelon sprinkled with a bit of sea salt accompanied by a lime wedge. (If you are having an after hours version of this melon dish, add a little splash of tequila and simple syrup to the watermelon, it's sooooo good!). 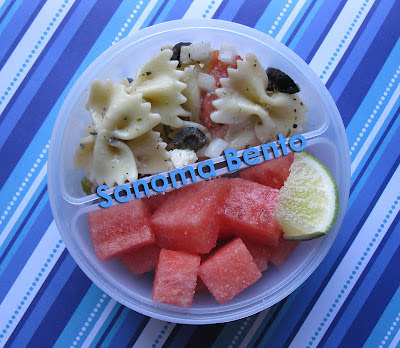 I added this bento to What's For Lunch Wednesday! Check it out for great bento ideas. Stay cool bento pals! This one says SUMMER! Would have been purr-fect for that crazy scorcher of a Saturday we just survived, huh? So fun that we share the same weather now, and as seeing you guys this sfternoon showed, the same nifty town!